Compromise. That’s what it’s all about, eh? We are taught from early on that the only way to get along is to go along. Meet halfway, in the middle. Don’t be such a stickler. Nothing is so sacred or important that it cannot stand a little compromise. And just where has this type of thinking gotten us? Just how willing should we be to compromise and lay our values down on the altar of coexistence? Just how much compromise do we have to accept to feel that it is okay to allow others to put poison in our food, to spray poisons on the land that we are supposed to be stewards of, to poison our animals that trust us to take care of them, to drop poisons from the sky, to put poisons in pills and vaccines that we are ordered to get if we want to keep subsistence jobs working for people who would rather see us dead than alive because we are just a statistic and replaceable, and to poison our very water supply? We are dying, and it’s our own fault. We are compromising our way into extinction with only ourselves to blame. But it’s okay if we keep believing the lies. If we keep hiding our heads in the sand and accepting the falsehoods that make us feel good, eh? We love the lies that make us feel like we are all powerful and in control of our pitiful existence. Yes, pitiful. Just how pitiful is it when poisons are sold next to healthy foods and we have to guess which is which, all under the banner of “choice” and “free will?” You tell me, because, quite frankly, I’ve had just about enough of it. I want truth. I want uncompromising truth, no matter how much it hurts. Answer: “Yes, we do.” She listed the brands. In other words, they want the customer to be able to choose between non-GMO and something unlabeled that might possibly be GMO, but you don’t really know because it is not labeled. That’s real choice, eh? If people simply stop buying the poisons, Trader Joe’s will concede to that and stop carrying them because the company will lose money, not because removing poison from store shelves is the right thing to do, but because it is cost-effective. No wonder she didn’t want me to quote her…. If people want it, the stores will sell it, doesn’t matter what it is. No values, no honesty in advertising. No concern for anything other than the almighty buck. Hey, if it works for me, then to hell with everyone else. Let the buyer beware. This is the same type of thinking that says my neighbor can spray Roundup all over his place and pollute my organic garden through toxic runoff. It’s his right to do so. What about my right to not be poisoned by his choices? My organics don’t hurt anyone, whereas his chemicals do. That is the difference. When poisoned food is placed side by side with good food, with no outward distinction, not to mention the ethics of poison being sold as food anyway, how exactly is that real choice? It’s not. It’s compromise. Coexistence, if you will. Each and every time we compromise we lose a little bit of ourselves in the process. Each and every time we decide that just a little poison is okay, just as long as no one notices, or because everyone is doing it, and I just have to make a living, so I have to, we lose another piece of ourselves to compromise. And just how much do we have to lose before we cannot regain what was once good and true? What are the consequences if “everyone does it” except for the minority that chooses to not compromise? The radicals. The freaks, if you will. The people who choose to take a stand and fight the good fight for uncompromising honesty? I guess if the majority wants to poison itself, the minority just takes it in the shorts. So much for democracy in action. We live in a world where good is bad and bad is good. 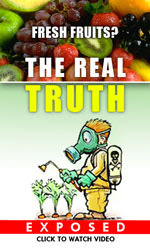 Where poisons are considered healthy, and good, clean food is illegal. Where people stand in line to register and poison their children, all mandated by a state that requires such “healthy” practices in order to participate in life on this earth. And don’t dare try to really be healthy and share the wealth by sneaking any raw milk to your neighbor or you just might end up in jail. But it’s all okay if the bottom line is in the black. If you have enough money to get all the zoo-zoos and wham-whams you want to keep yourself occupied with triviality while the world around you crumbles in a pile of toxic waste. For those who couldn’t care less and prefer the status-quo, just keep making money and living the lie. It’s easier that way. But for the rest of us who have a burning for the truth, and who spend every last breath here on earth searching for it, it’s not nearly enough. No lie will replace it. So, we stand. We stand in the truth, and try to do what is right. We plant our heirloom seeds and pray for rain. We watch our gardens grow and feed our animals with the last remaining shred of food that hopefully has not been poisoned by liars, deceivers, and those who choose to compromise and coexist. When you are surrounded by falsehoods and compromise, it’s time to make a choice. Sometimes, that choice is a hard one, but one that must be made by every man, woman and child on earth. That choice is to either stand for the truth or die defending the lie. As for me, I choose to stand for the truth, come what may. Please join me. It’s our only hope in a compromised world full of deceit and trickery.